BEFORE the advent of the Internet, we were all reliant on reviews that came to us by word of mouth. From a family member to a friend of a friend’s, we took their word for gospel and put much faith in their truthfulness. Today, we are no longer bound to listening to first-hand or second-hand reviews since with several clicks of a button, we can access a mind-boggling archive of hundreds and thousands of reviews made by people from far-flung corners of the Earth. 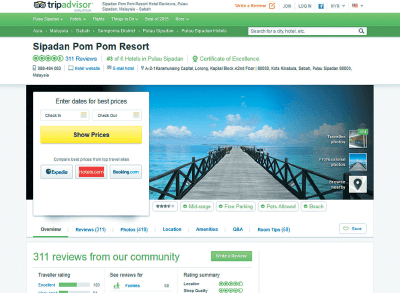 TripAdvisor, the world’s largest travel site recently conducted a survey of over 100,000 travellers and hospitality business owners to ask about their opinions on what makes good reviews, seeing as they have become a powerful tool for travellers around the world to make informed decisions about planning and booking their vacations. According to survey respondents, the three most important things in a review are that it concentrates on facts (56%), that it provides a lot of detail (48%), and that it’s concise and to the point (41%). In terms of the style of the review, 83% of travellers want to read a balanced review, while 69% say that it’s important to provide the context for why the reviewer liked or didn’t like something. For restaurant reviews, 81% of respondents claimed that they want to hear more about food quality followed by the service. On the other hand, for attraction reviews, it’s all about the advice: 75% of travellers want a review to include practical tips that can improve their experience. The survey also revealed the biggest turn-offs for people when reading reviews: overly picky reviews are the No 1 turn-off among travellers (54%), followed by a lack of detail or specifics on what the reviewer experienced (50%) and bad grammar (42%). TripAdvisor Travel Advocate Wendy Perrin, who has been a travel journalist for two decades, said, “What I have found to be really beneficial is to include in your review what you wished somebody had told you ahead of time, pinpointing what was out of the ordinary or unique about the experience, as well as taking a photo of the view from your hotel room”. Why do people bother writing reviews in the first place, though? That’s because people want to “share useful information with others” and because they “find reviews helpful, so they want to give back”, according to 83% of survey respondents.